LOVE is free and it's the best when is wild and a little drunk. On Thursday 14th February, come with your Valentine, or if you dont't have one, fiind it in 4rooms! And girl's remember, pretty girls in pretty dresses, partying until down! FREE drinks for the ladies ALL NIGHT LONG! In charge for vibes and emotions: DJ Andrei Nica alongside DJ Lau Maftei. Intrarea liberă pe baza flyer-ului pana la ora 00:00. 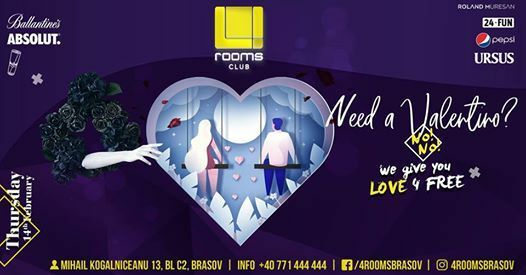 4rooms isi rezerva dreptul, de a-si selecta clientela!